Hello! Today I have a quick swatch of a polish from UK indie Opulent Essences to share with you. The lovely Sharon knows I love everything orange, and was kind enough to send a bright sparkly prototype one my way. It hadn't been properly named yet, and as it looked quite 'fizzy' to me, we decided to name it 'Tango'. Read on for my swatch and more info! 'Tango' is a bright orange base full of fine holographic glitter. The base has a slightly sheer jelly finish to help the glitter shine through. The formula is really smooth and easy to apply. It built up well in two coats, but I did add a third to fully cover my nail line. If you have shorter nails you should be fine with two, although I also love the extra depth a third coat gives. The glitter dries a tiny bit textured, but is easily smoothed with topcoat. Below is three coats and topcoat. What do you think? I absolutely love it! 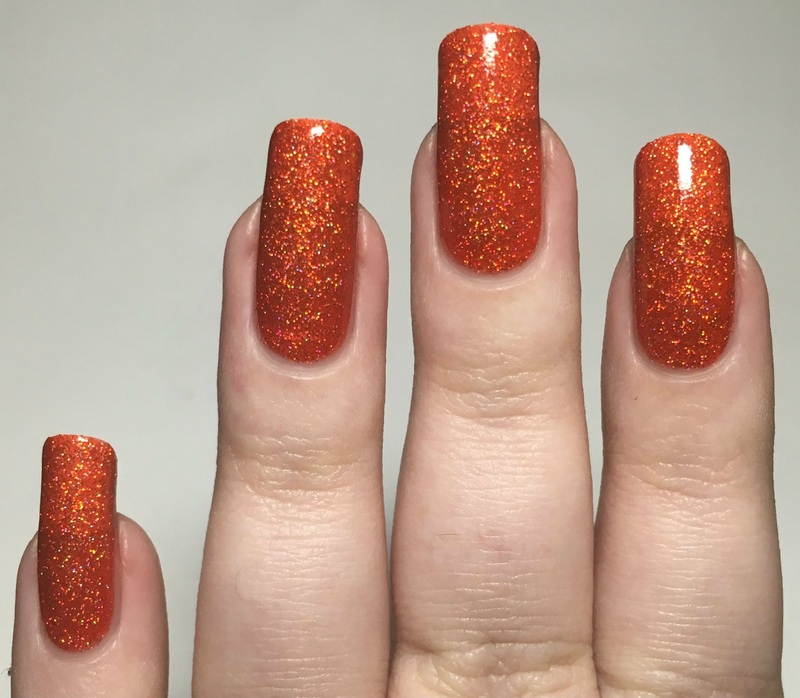 Like I said I am a massive orange lover, and the brighter and sparklier the better! 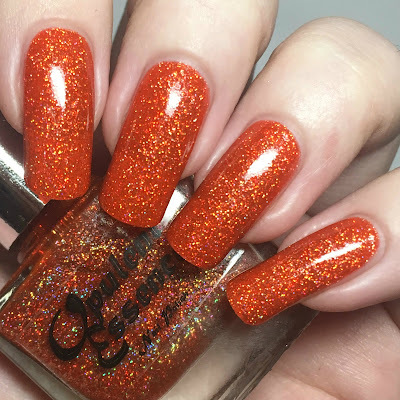 This polish is still in the testing stages for now, but hopefully if Sharon can get her hands on more supplies then she can release it as an official shade. Would you buy it? You can find the Opulent Essences website here. You can also find them on Instagram here for more swatches and updates. That is such a unique color. Wow - that sparkle is amazing. I love darker oranges and this is just gorgeous! I absolutely love how sparkly this is! Absolutely beautiful. Unique shade. Love it. Ooh it looks so pretty and I totally get where you're coming from, 'fizzy' sums it up so well. You picked the perfect name! This is gorgeous! I am shaking my fist at the Royal Post for making it impossible for me to buy UK indies. Everything always looks so flawless on your perfect nails! You wear orange so well! This is so sparkly and perfect! Oh this is gorgeous! So pretty!